Phelps was coming up in the age of the Thorpedo. The pair of them were taking the swimming world by absolute storm as they were so young to be swimming so fast. In 2001 at the ripe old age of 15 Phelps became the youngest male swimmer to break a world record in the pool (the record was previously held by Thorpe at over a full year older when he broke the 400m free world record). Phelps beat the WR in the 200 fly at the Americans’ World Championship Trials, and then would break it again en route to becoming world champion later that year in Fukuoka, Japan, which would only be a tease of what was to come two years later. The next time Worlds came around in 2003, Phelps’ range and depth became apparent, and this was when the swimming community and world at large began to fully comprehend that there was something intrinsically special about him. He started the year off at Nationals winning the 200 free, 200 back and 100 fly, becoming the first swimmer in US history to win three races in three different strokes at a single National meet. Later that year he would break the 400IM world record at the Duel in the Pool meet between the US and Aussies (4:10.73), and set his first mark in the 200 IM shortly afterwards at a meet in Santa Clara in 1:57.94. Worlds would be where he would truly make his mark, with a 4-gold, 5-WR performance. He lowered both IM marks – dropping nearly two seconds off of his own 200 record, and taking the 400 below 4:10 for the first time in history. He broke his own 200 fly record in the semi’s (1:53.93), swam an American record of 1:46.60 on his lead-off leg of the 4×200 free relay, and would also break the WR in the 100 fly (even though Ian Crocker would beat him in the final and take the record). Phelps’ accomplishment in Beijing is all the more impressive when his times from 5 years previous are held up against his performance at the Games. In all, Phelps would set an Olympic record 8 gold medals, with 7 of those swims coming in world record time, with only his 100m butterfly swum “only” in Olympic record time. The 400IM mark he set still stands as a world record to this day. He would break his own record by another two seconds, finishing in 4:03.84. The biggest obstacle Phelps had to win 8 golds was the 4×100 free relay, with the favored French boasting a line-up that included world record holder in the 100m freestyle Alain Bernard. Ultimately, Jason Lezak would have the swim of his life anchoring the relay in a ridiculous 46.0, out-touching the French in world-record time and keeping the streak alive for Phelps. Currently (01/14/14) Phelps still holds 7 world records – three individual events and 4 as part of US relay teams. 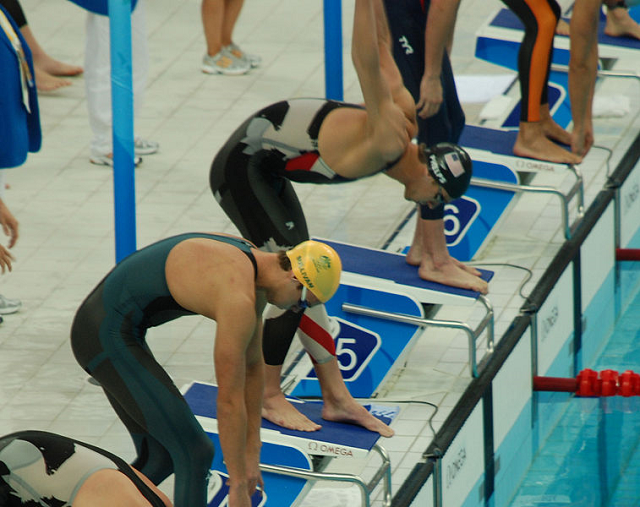 The individual races were done either in Beijing in 2008 or at the FINA World Championships in Rome during the super-suit record frenzy of 2009.